It’s been just over six years now since the blues world lost singer, guitarist, and rising star Sean Costello. 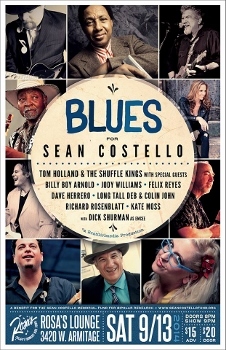 In that time, we’ve seen several new CDs of Costello material – including a good number of previously unreleased tracks on 2009’s Sean’s Blues: A Memorial Retrospective and 2011’s At His Best – Live, both from Landslide Records – with another collection of as yet unheard tracks currently seeking funding; here’s how you can help. As much as we’d like to be able to remember Costello solely for his musical talents, it’s difficult to separate his work as an artist from the tragedy of Sean’s death on the eve of his 29th birthday, soon after which it was revealed that Costello had been battling bipolar disorder. Sean’s friends and family quickly rallied to establish The Sean Costello Memorial Fund for Bipolar Research, an organization dedicated to keeping Costello’s personal and musical spirit alive and translating the human side of his suffering into action that will help in research education, outreach and treatment efforts for bipolar disorder. For many, Sean’s death has helped to put a face on the condition of bipolar disorder, and Costello’s friends and family in turn have helped to ensure that the bluesman isn’t soon forgotten, not only through the release of those new albums and the establishment of the fund but also through events in remembrance of Costello such as the one taking place at the famed Rosa’s Lounge in Chicago this coming weekend. Featuring Tom Holland & the Shuffle Kings with special guests that include Billy Boy Arnold, Jody Williams, Long Tall Deb & Colin John, Kate Moss, Richard Rosenblatt, and others, this Saturday night show will both celebrate Sean’s life and help support the fund that bears his name. If you’re anywhere near Chicago or looking for an excuse to make a last-minute visit to the Windy City, this is sure to be a great night of performances for a very worthy cause. For those unable to make it to Chicago, you can catch a free stream of the event online at Gigity.TV. This entry was posted in Albums, Shows and tagged Billy Boy Arnold, Colin John, Jody Williams, Kate Moss, Long Tall Deb, Richard Rosenblatt, Sean Costello, Tom Holland. Bookmark the permalink.